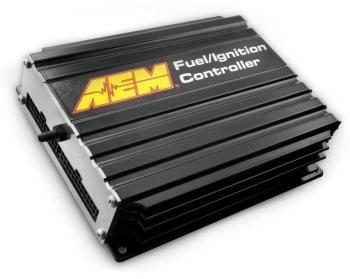 AEM’s F/IC is a PC-programmable piggy-back controller that allows users to retard timing and add fuel to virtually any engine, even on variable cam timing engines (VTEC, iVTEC, VVTi, MiVEC, etc.). The F/IC is the perfect solution for eliminating outdated FMUs and “boost hiding” electronics and is ideal for newer cars with knock detection that have non-factory forced induction systems. The F/IC uses a vehicle’s factory base map to create calibrations via a powered USB connection to a PC, so drivability and cold start are not affected. Since the F/IC modifies the factory timing patterns it is not necessary to know them in advance. The F/IC can also recalibrate sensors so users can add a MAP sensor for boost without affecting the signal to the ECU. Since the F/IC is a trim device it will not cause the factory ECU to throw a “check engine” light because it allows the user to intercept and modify the cam and crank inputs. Additional injector drivers allow users to control up to six additional injectors for high-horsepower vehicles. And it works on variable cam timing engines. I found the FIC to be very simple. It will take a little while to properly wire in if there isn’t a pre-fab hardness for your car but the interface is very user friendly and most communities are sharing maps for it. I recommend it for anyone looking to tune their car without the expense or complication of a stand alone.